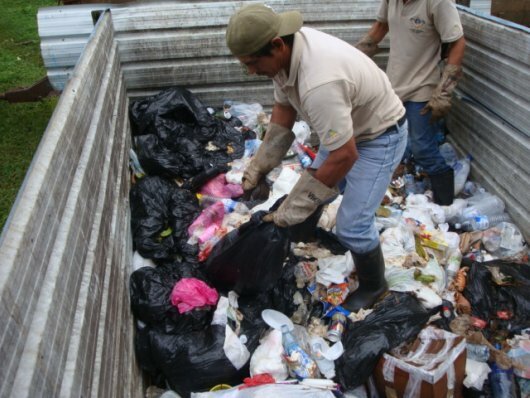 This post is one in a series by a team of MIT students conducting a waste management analysis in the Region Autonoma del Atlantic Sur (RAAS) of Nicaragua. The trash collectors of Corn Island, Nicaragua. 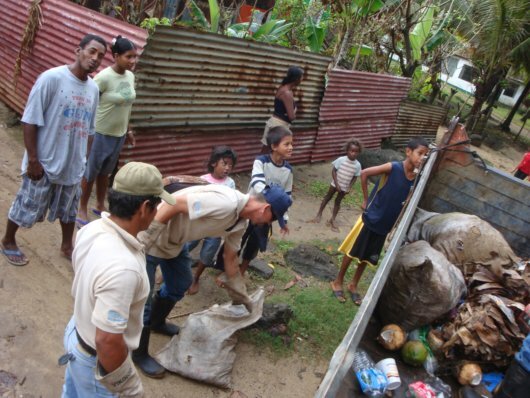 While on Corn Island, Nicaragua, I accompanied the municipal trash collectors on one of their collection routes. There isn’t a lot of space to put trash on Corn because it’s an island. Making matters worse, a lot of the solid waste that the people of Corn Island have to deal with does not necessarily come from residents on the island. As we went along the trash route collecting from households and businesses, it became clear that the tourist hotels produced the greatest quantities of non-organic trash. Another source of non-organic trash is the piles of plastic bottles and containers and old refrigerators and boat parts that wash up on Corn Island’s beaches. What should a small island do when so much of its non-organic waste stream comes from non-resident sources? 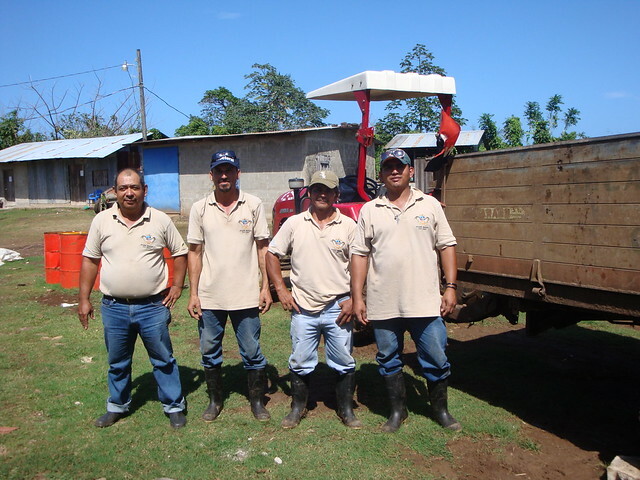 The mayor of Corn Island hires four men in an old farm trailer pulled by a tractor to collect trash and put it in the island’s currently overflowing dump. The collection route I observed started in a residential neighborhood. As families heard the tractor coming down the dirt road passing through the middle of the neighborhood, they brought out old polypropylene corn sacks from their homes that are only accessible by foot path. The trash collectors emptied the sacks into the open trailer, returning the sacks to the residents for re-use. The trash from this neighborhood was mostly organic waste: leaves from yard waste, fallen palm fronds. The collectors repeated this process again and again as they went along their route — they emptied sacks or buckets of household trash, mostly organic waste, into the trailer, and returned the containers to households to re-use. At one house they collected an old broken suitcase full of metal parts. The trash collectors held this load aside because metal has a high value and can be sold to local metal recyclers known as chatatereos. Later in the route we stopped to collect from several hotels. These were the largest volume pick-ups along the route. I noticed the trash from these hotels was full of plastic water bottles and fancy food packaging. Non-residents create so much waste. Hotel waste: lots of non-organics. The trash collectors commented to me that they know the hotels produce such a large amount of non-organic waste, but they are also an important source of income for the local economy. I noticed, however, that most hotels on the island are owned by foreigners and there is a great deal of debate amongst islanders as to how much of the hotels’ profits are actually shared into the local economy. Tourism is certainly a double-edged sword, and one of its major impacts on the island is the production of greater quantities of non-organic solid waste. Corn Island also works hard to keep its beaches clean. Four times a year the mayor’s office organizes community beach clean-ups. I was told that during the December clean-up over 200 sacks of solid waste were collected, along with other bulky items such as refrigerators and boat parts that had washed up on Corn Island’s shores. Wherever the carpets of plastic bottles and boat parts are dropped into the ocean, they become Corn Island’s problem. Post and photos by Sarah Lince.